It’s that time of the year again – the Henty Machinery Field Days are here! Henty is Australia’s premier mixed farming event, located in southern NSW. 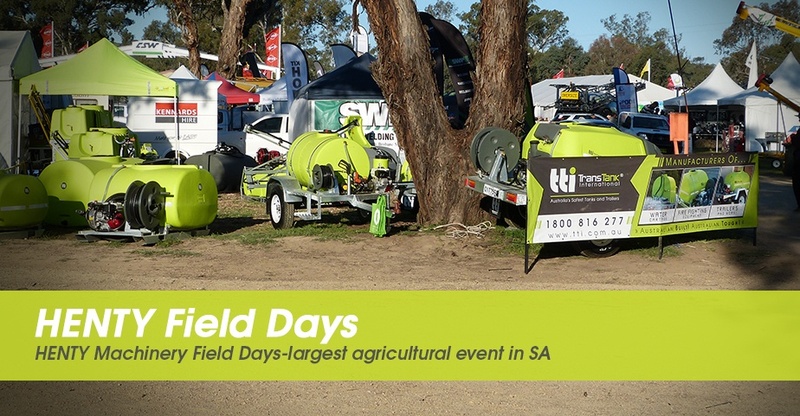 Attracting over 60,000 visitors each year, the Henty Field Days are now considered to be the single largest agricultural event in Southern Australia. On site, you can find the latest in machinery and farm equipment, outdoors and camping products, farm produce, agronomy, country lifestyle, government and health services, agribusiness and financial services. In 2016, the Henty Field Days are hosting 800 exhibitors over 1200 sites on their permanent 105ha site. Known as an agribusiness supermarket, there is something for everyone – it’s a real family day out! TTi can be found at site L452 and are exhibiting a range diesel units, sprayers, water cartage tanks and fire fighting units including a number of exciting new releases. Make sure you pop by and have a chat to the TTi team! For more information on our new products, check our Spring-Up Deals flyer, or give us a call today!